Cooking the pork in this manner turns your grill into a big oven. 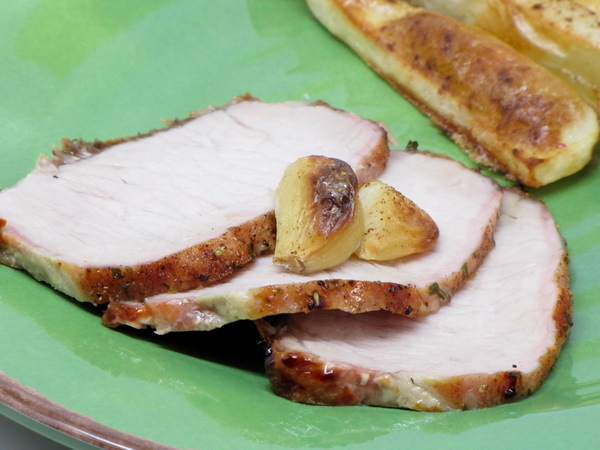 Be sure to sear the pork at the end of the cooking process so you get a nice browned outside. 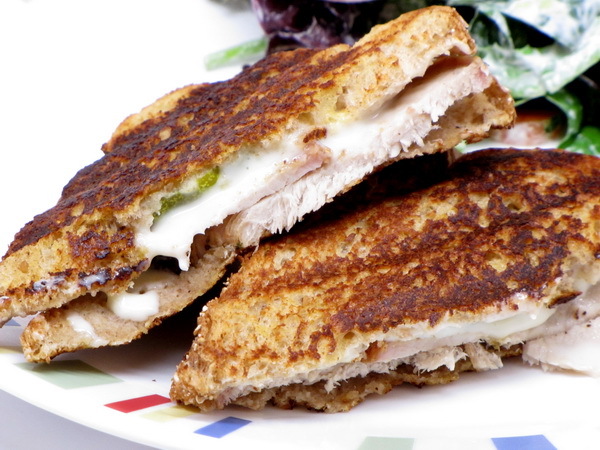 Serve with Oven Fries and a salad for a great balanced meal. Leftovers are great for making Cuban Sandwiches. Trim fat from roast. Mix all spices together to create a rub and sprinkle it evenly over the meat and rub it in. Heat grill – lower heat to medium low – shut off one side of the grill so that you can grill with indirect heat. Place meat on a rack in a baking pan and place on the side of grill that is NOT on. Cook 1 ½ hours. Sear the meat on the side of the grill that is on for just a few moments, then remove from grill and let sit 15 minutes before slicing. Place all in a blender and mix well. Spoon into popsicle molds and freeze at least 4 hours. Lunch salads don’t have to be the same boring thing day in and day out. This one has marinated grilled chicken and artichokes giving it a great Italian flavor. Pour ¼ c dressing over chicken and refrigerate ½ hour. Heat grill and cook chicken 6-8 minutes each side or until done then cut into strips. 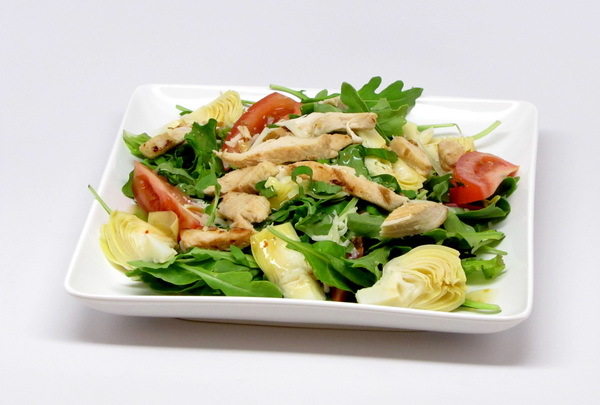 Combine arugula and lettuce and top with artichokes, chicken, tomatoes, cheese, basil and the rest of the dressing. 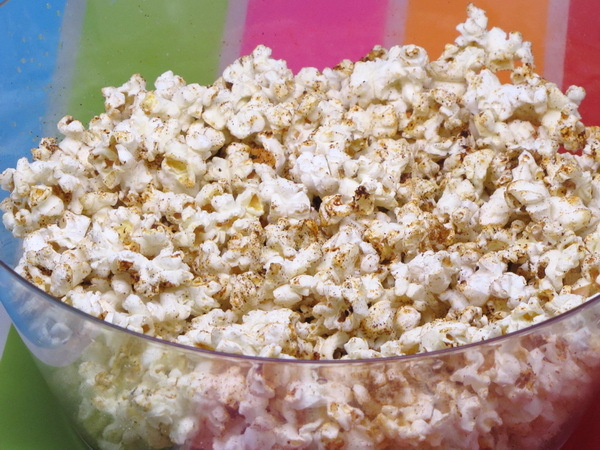 Toss popcorn with lime juice and then add chili powder and hot sauce and mix well. 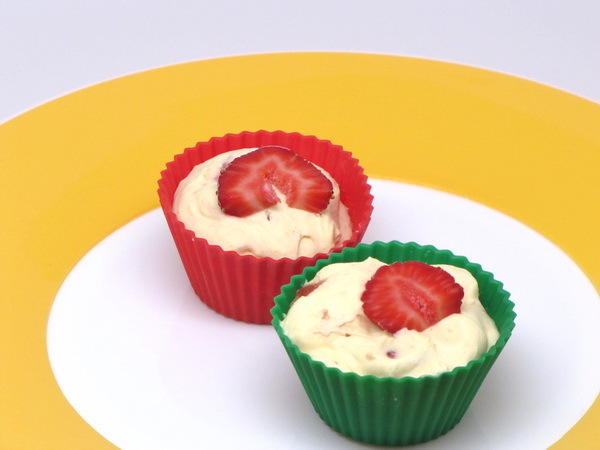 This is like a pudding pop with strawberries – very rich, very creamy and very delicious ! Beat cream cheese until creamy and gradually beat in milk. Add pudding and beat 2 minutes (it will be quite thick) then stir in cool whip and berries. Swirl in topping. Divide cookies among 18 cupcake liners (I use silicone ones) then spoon in the strawberry mix, garnish the tops with extra berries and freeze 4 hours. Let sit out 10 minutes before eating. Last night I was watching Masterchef and the most awesome looking recipe was cooked ! It was Cat Cora’s Truffled Halibut, which in recipe books by Cat Cora is also referred to as Pan Seared Halibut with Sweet Corn Zabaglione. Today I am going to make an exception and list a recipe here that comes in higher than 400 calories – this one just looks too exquisite to miss. And it’s just a few calories over 400 – barely enough to count 😉 With all original ingredients this one comes in at around 850 calories per serving. But by using fat free half and half instead of heavy cream and frying the zabaglione onions in Pam and some water instead of oil , you can come in at about 449 calories – not bad at all for a gourmet dish. As soon as I make this, I will post pictures – for now, I just wanted to get the recipe up for you. Prepare the cream sauce – Heat a skillet and spray with Pam and cook corn and garlic 4 minutes. Add the half and half and simmer on very low heat 10 minutes. Because the half and half has no fat, you have to be careful to not let this come to a boil. Transfer all to a blender and puree until smooth and then strain through a fine mesh sieve. Bring 1 inch of water to boil in a double boiler and pour the corn puree into a bowl and whisk in the egg yolk then place in the top pan of the double boiler and whisk until thickened, about 10 minutes. Season with salt. For the fish – Preheat the oven to 400 degrees. Season the fish with salt and pepper. Heat 1 T oil to very hot and them saute fish 2 minutes per side being sure to get a nice golden sear on each side. Transfer to oven and bake 5-6 minutes to cook all the way through. Bring 2 c of water to a boil and boil the shelled fava beans for just a minute or 2 to soften them some. Toss together arugula, beans, tomatoes, onion and corn and mix with 1 T oil, salt and pepper. Divide the cream sauce on dishes, plate the fish atop it and add the salad bits to the top. I figured you might be getting together your plans for Labor Day and looking for some great summer recipes – over the next week I’ll be re-posting some of my favorites from the past couple of months. These are great dishes for BBQ’s and picnics. If you are looking for more ideas, be sure to click the SUMMER category in the list over on the right side of the page ! 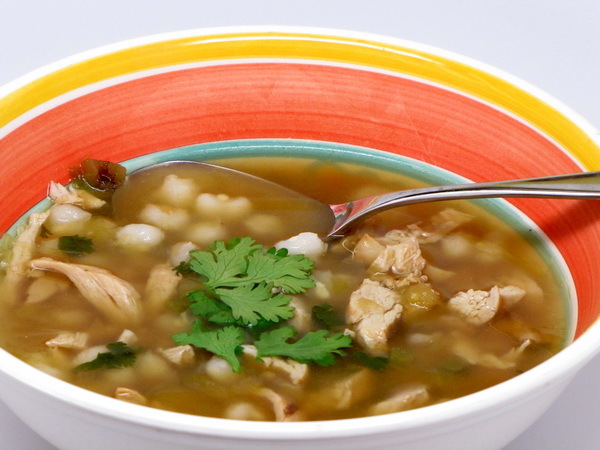 I think this is the Mexican version of leftover soup – a bit of salsa, a bit of hominy, a bit of chicken, a bit of cilantro – – and all seasoned with cumin, that wonderful spice that makes it taste so rich. Mix broth, hominy and salsa and bring to a boil. Toss chicken with cumin and add to broth and simmer 10 minutes. Place in bowls and garnish with cilantro. Add in some ham and this is a pretty authentic sandwich – it’s just on whole wheat slices rather than a roll. But for only 285 calories, I’ll give up a little authenticity – and you don’t have to give up on ANY of the flavor ! You can add some mustard if you like, but I like this one plain. Make a sandwich of the pork, cheese and pickles. Heat a grill pan or frying pan and spray with Pam. Spray one side of the sandwich with 5-10 spritzes of ICBINB spray and lay the sprayed side down. Grill 3 minutes pressing down on the sandwich lightly. Spray the top of the sandwich with ICBINB and flip then continue cooking 2-3 minutes. 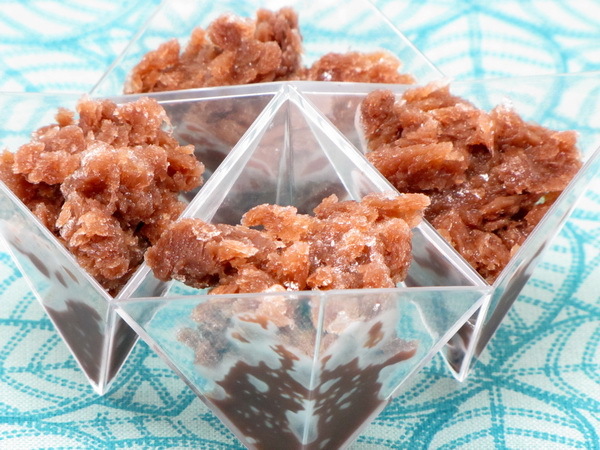 Think Chocolate Italian ice but with more of a coffee flavor – and that describes this pretty well 🙂 A great dessert for only 70 calories and a perfect ending to a summer night. Place a 13×9 metal pan in the freezer to chill. Combine all ingredients and cool for ½ hour then pour it into the pan and place in the freezer for 30 – 60 minutes. When ice crystals form on the edges, stir with a fork being sure to pull away all the frozen pieces around the edges and freeze another 2-3 hours stirring every ½ hour.